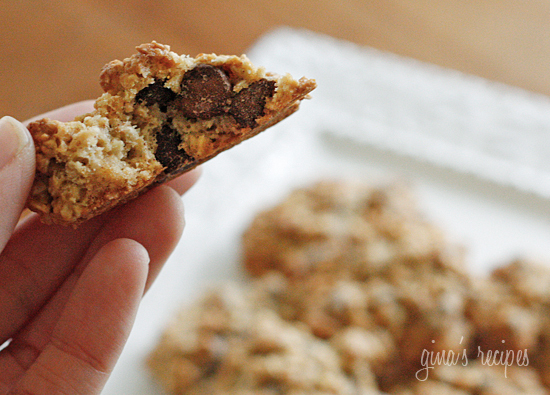 Chewy, moist oatmeal cookies loaded with chocolate chips, in a reduced fat cookie? These cookies are fabulous and they are loaded with chocolate chips in every bite! Don’t you hate when you make a low fat cookie recipe, only to be disappointed? These will become a favorite in your home, give them a try and tell me know you think. Try them first as is, then have fun coming up with variations. I came across this recipe on Baking Bites and this will now be a regular in my cookie jar! 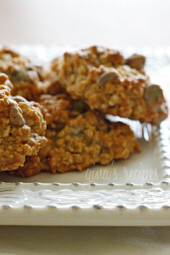 I’m so excited to make them again with different ingredients, like raisins or walnuts! As noted on Baking Bits, it’s crucial not to over-bake these if you want them chewy. The applesauce makes them moist and if overcooked they will become dry so if you’re not sure if your oven runs hot it’s probably best to take them out a minute earlier. I made the serving size 2 cookies, because I can bet you won’t eat just one! In a medium bowl, whisk together flour, baking powder, baking soda, salt and cinnamon. In a large bowl, with a mixer, cream together the butter and the sugars on medium speed. Drop heaping tablespoonfuls (approx 1 tbsp each) of the dough onto prepared baking sheets, flattening each cookie slightly (I forgot to do this). Bake for about 10-12 minutes, or until cookies become light brown at the edges. Store in an airtight container so you don’t eat them all in one sitting! Just made this for my hubby who’s on a low fat diet. I baked them for 11 min, and they were amazing!! (I used my own homemade apple sauce which I have to say is way better than store bought ) The only thing is, I thought that for low fat they would be less calories…at 95 calories each, still seems high to me. Otherwise, amazing!. These cookies are excellent! Takes a short time to make from start to finish, and the cookie is delicious. I accidentally used 1/3 cup white sugar instead of 1/2 and the flavor was still on the mark. Thank you Gina! I love making your recipes! Your Recipes are so easy to follow! I made the PB2 brownies and today I did the oatmeal cookies! Thank you! Sooo good! Just made this now. Hubby and kiddos loved it! I didn’t have apple sauce so I used plain Greek yoghurt. Turned out pretty well! Will surely make another batch. Thanks for the recipe, Gina!!! These were amazing! I subbed half the white sugar with sweet and low bulk sweetener. I put a couple of walnut pieces on top of each cookie before I baked them. I just ate 6 of them. Seriously delicious!!! Delicious! Guilt-free! Just sweet enough. Added a few walnuts. Just made these and they were amazing! Chewy and tasty – I added walnuts and used 1/2 cup choc. chips. Great recipe! 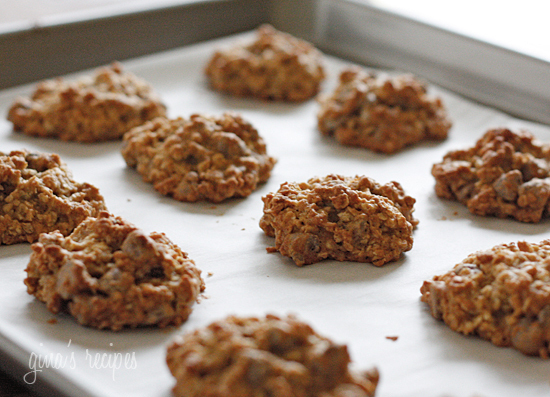 I baked for 11 minutes and found them more crunchy than chewy….but loved them! Next time I might cook for slightly less time…..
Why would you recommend Splenda for this? Ghastly, toxic stuff. If you don’t want to use it, then don’t. Everyone has their opinion on splenda…Perfect for diabetics, so keep credible please!! I'll add my praises for this delicious, nearly guilt-free treat! Serving them for dessert tomorrow night with sorbet. Oh, and the main dish is your Black Bean aD Butternut Squash Enchildas with Chipotle Cilantro Lime Rice! You make eating healthy easy! 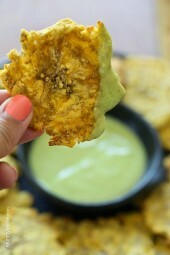 I just made these and they are DELICIOUS!!! Wow! My 3 year old is begging me for another one as I'm typing this. Just got these out of the oven….delicious! Thanks for sharing! I did substitute coconut oil for the butter and used mint chocolate chips. I believe I'll be making another batch soon as I can tell they won't last long. Made these today and they were fantastic! I didn't have any apple sauce so i just blended up an apple from the fridge with a tiny splash of lemon juice. Also left out the chocolate just because I'm a weirdo and not a big fan of chocolate. They were so great! And like you stated, the possibilities are endless with add ins. Thanks so much! I know I can always turn to your site for healthy and yummy foods! These are the best cookies of yours that I have tried. They look just like the picture and taste great! These were great but too sweet for my taste. Next time I'll reduce the sugar and use whole wheat flour. Great recipe! yum. Made this cookies over the weekend, they were a big hit. Will definitely be trying to make these cookies more often. Thank you for the recipe!!! 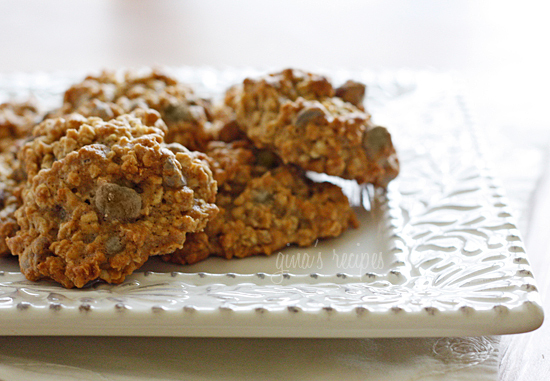 My dad loves plain oatmeal cookies, so I used this recipe omitting the chocolate chips. The batch turned out to be 22 cookies. All were gone in one day. Even my 17-year-old sister, who hates my guts, ate a few! My dad ate about 7. A great recipe! I made these over the weekend and they were a huge hit. I'm not a big dark chocolate fan, but I went ahead and used dark chocolate chips anyhow and I really couldn't tell when I ate the cookies that they were dark chocolate chips. THANKS! Thanks so much for your recipes! I would love to turn this recipe into a cookie cake for my boyfriend's birthday and was wondering if you had suggestions on baking time? Can I use regular oats? I don't have quick oats and I like the bigger size oats in cookies also. This may just be the best oatmeal cookie I ever made. delish!! These are good, if anything a little too sweet. I used sugar in the raw in place of the white sugar and whole wheat flour. Used 1/2 c choc chips and 1/2 c dried cranberries. Next time will use 1/2 c brown sugar and 1/4 c raw sugar. Not bad for lowfat coookies!! Hi! Thank you so much for this recipe! I've been experimenting with low fat/fat free recipes and am so pleased to find this one! I made a couple additions: 1/3 C. extra oatmeal – due to misreading! I also added 1/3 C. each currants, cranberries and a few tablespoons of chopped dark chocolate chips. They are crispy, moist and spectacular!!!! Would it be all right if I posted the link to your recipe on my blog? I'm confused, this is listed under gluten free recipes yet it calls for all purpose flour. Doesn't that have gluten? my tablespoon dropper only made 18 cookies gina. can you help me out with the points please? I have made these twice so I can vouch for how good they are. Taste tested and approved by hubby, and he asked me to make them again. I am thinking they would be great with some P2B powder added? Maybe would need to increase liquid a little if you do. Any suggestions on best way to do that? Another winner! I made these as directed and they came out fantastic. Wow! What an awesome treat! I've been thinking about ditching store bought work treats like granola bars and decided to try these. Plus I just started WW and i still NEED chocolate. These turned out so grand and it will serve me well over my afternoon tea break! These just may be TOO good to share! These were awesome! I used semi sweet chips as thats what I had onhand. I also used the old fashioned oats worked just fine! 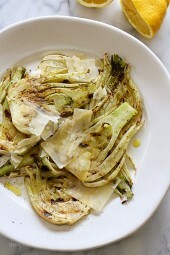 A great recipe even if your not on Weight Watchers! What I can substitute the baking soda with? Made these tonight, awesome cookies. I used whole wheat flour and for the walnuts, I used half walnuts and half slivered almonds. DELISH! Thanks Gina. So…I know that there have been about a million posts on these, but I can't help it because they came out so amazing. Nothing is ever low cal/ low fat enough for me, so…I subsituted Land of Lakes 50% less fat/calories butter, 2 tbls nectresse instead of white sugar (kept the brown sugar to maintain flavor/ texture), 3/4 cup whole wheat flour & 1/4 cup ground flax in place of A/P, and 1/4 cup egg substitute. I also like 70% cacao bittersweet Scharffenberger baking chunks.108 calories, 4g fat per 2 cookies. I am going to add protein powder next time, which will up the calories a litte, but then I can call them protein bars!!! Fantastic cookie! I've made them twice in one week. My spin: Brummel & Brown "butter" and Egg Beaters. Just wanted to say the recipe for the cookies are delicious and easy to make. 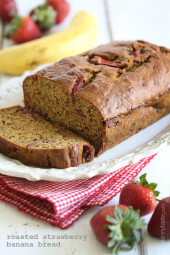 I started making them with mashed bananas and they are even more delicious. I make these at lease once a week so GOOD!! These are great super moist and delicious people did not believe they were light! These turned out so good! My husband loved them almost as much as i did 😉 thanks for all of your great recipes! Made these tonight and they are delicious! Used semi-sweet chocolate chips, though. Thanks for another great recipe. I just baked a batch and they're amazing!! I can't imagine making a regular version when this low fat version is tastier than any other recipe I've tried! I was a little skeptical when dropping them onto baking sheet since it seemed a little too dry but after they came out of the oven, they were chewy and soft. I'm not sure that they'll last till tomorrow! Everyone LOVED them! My son has an egg allergy – is there an easy substitute for egg for this recipe? I sometimes use applesauce — but i see that there is already applesauce in it. Any suggestions? These are yummy! I am just loving your site. Everything I've tried so far has been a keeper. Just made these and I had some quick cooking steel cut oats (1 cup ) that I used in addition to the regular oats (1 cup ) and they are so VERY GOOD. Love them. Thanks for the recipe. Gina- Excellent recipe! I baked it tonight and loved it. I didn't have pepitas so I sprinkled brown sugar over top instead. these are awesome!! I used oil instead of butter, and i added some dark cocoa powder, so they are chocolate chocolate chip. yum!! Would it work to replace the applesauce with pumpkin? Sounds good. Toll house has dark choc. Chips. Great. Gina, can we freeze them raw and bake as needed. I usually do that with regular chocolate chips so I can make a few at a time.